Restores elasticity to mature skin ? Citrullus lanatus originates from the western Kalahari region of Namibia and Botswana, where it can still be found in the wild in a diversity of forms together with other Citrullus species. In this region, there are two major types, one with small fruits that are generally bitter and mainly used for their seeds, called ‘tsama melon’. This is the probable ancestor of egusi melon. The other type has fruits that are mainly used as a source of water during periods of drought or as cooking melons, and may well represent the ancestral form of the watermelon, fodder melon and cooking melon. People in Namibia and Botswana still harvest most of their seeds from the wild, but some landraces have been selected specifically for their oil-rich seed. 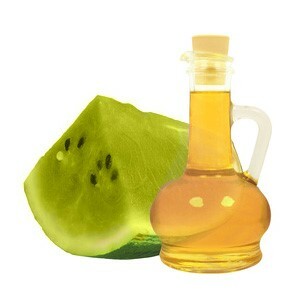 Kalahari Melon seed (KMS) oil is the golden oil of Southern Africa. 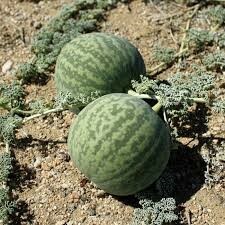 The Kalahari melon is highly adapted to surviving drought and the harsh light of the desert environment. Although found all over Southern Africa, it is most closely associated with the Kalahari sands of Namibia, Botswana, south-western Zambia and western Zimbabwe. 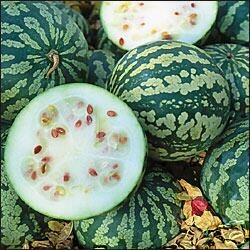 It belongs to the botanical family of Cucurbitaceae. • Virgin KMS has an omega-6 essential fatty acid composition that is comparable to Evening Primrose (68% vs 72%) giving it strong moisturizing and restructuring properties in skincare application. • The oil also has a high phytosterol content with nearly 2% unsaponifiables. 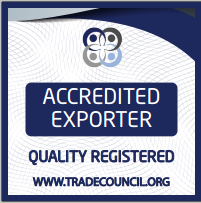 • This includes ß-sitosterol, campesterol, stigmasterol and 5-avenasterol. The skin’s stratum corneum has a significant sterol component (14% of lipids) and this is integral in maintaining barrier function in skin. • Further resistance to oxidation is brought by the phenolic acids that are present – gallic, protochatechuic, vanillic, syringic, ferulic and caffeic acids. • It is commonly used as food oil and has very low risk of sensitization and has good resistance to oxidation. The KMS seeds are removed from the fruit after cutting it open and then it is washed clean and dried before further extraction or decortication is done. • The kernels are extracted from the seed husks by means of a mechanical decorticator which removes the hard, outer part. The kernels are then sieved out for pressing. • The kernels are pressed without decortication. Presing is done by means of hydraulic or screw presses and can be operated manually or driven by electric motor. Most KMS is wild harvested at present and therefore the potential of generating money with it can alleviate poverty in many poor areas. Jacks, T. J., Hensarling, T.P. and Yatsu, L.Y. (1972) Cucurbit Seeds: I. Characterizations and Uses of Oils and Proteins. A Review. Economic Botany 26(2): 135-141. Lazos, E. S. (1986) Nutritional, Fatty acid, and Oil Characteristics of Pumpkin and Melon Seeds. Journal of Food Science 51(5): 1382. Maggs, G. I. Agricultural potential of indigenous Cucurbitaceae in Namibia, Published by National Botanical Research Institute of Namibia (NBRI). Ogunsua, A.O. and Badifu, G.I.O. (1989) Stability of purified melon seed oil obtained by solvent extraction. Journal of Food Science 54(1): 71-73. Rugheimer, S. (1997) Chemical characterisation of the oil extracted from Citrullus lanatus seeds. University of Stellenbosch, South Africa.